We normally head straight to the beach on the weekends, but this weekend we're heading for the hills. We're going hiking! Join us on @Loomstate_Org Instagram for a weekend of trails, wild edibles, and hopefully a group shot at the summit! Dirtbag Darling gave us some great tips on how to break in our hiking boots before we set out. After all, we are New Yorkers and don't don our hiking boots as often as we'd like. 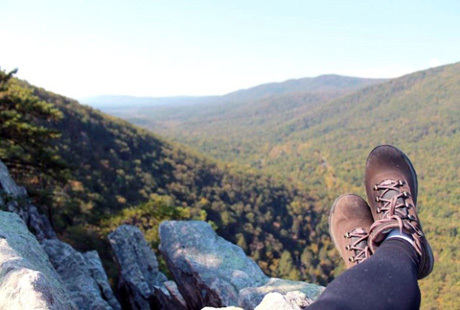 See her tips below for your next hiking trip - send your hiking/camping tips to @Loomstate_Org. 1. Make sure they fit right at the store. Your boots will stretch a bit over time, but not enough to make you size 7.5 boots fit your size 8 feet. Ask a salesperson to help and take your time making sure the boots fit right before you check out. *Tip: Bring thick wool socks to the store so you can test the boots for cold-weather hikes, too. 2. Wear your outdoors shoes inside. Lace your boots up tightly when you hop out of bed and wear them while you cook breakfast and get ready for work. They’ll feel a little stiff, but take notice of any severe pinching or rubbing—you may need to dig out your receipt and make a return. 3. Go for a short outdoor walk. Once your boots feel like they fit well, run some errands or take the dog for a walk while wearing them. Wear them for short periods of time often, until they start to form to your feet and the ankle support softens a bit. Heavy-duty leather boots will take longer to break in than their lighter cousins. 4. Don’t ignore hot spots. A little irritation at home can quickly turn into a deal breaker on the trail, especially once you add the weight of a pack. If you notice significant rubbing or pinching, you’ll want to exchange your boots, though some problem areas can be fixed at a shoe-repair shop. 5. Be prepared for blisters anyway. Educate yourself on basic first aid even if you shoes fit well. If you’re a serious hiker or backpacker, you’ll be in the same boots day after day over long distances. Invest in high-quality shoes, but be ready for injuries. Try preventing blisters with a great product called Blister Shield, which I reviewed over at GrindTv.